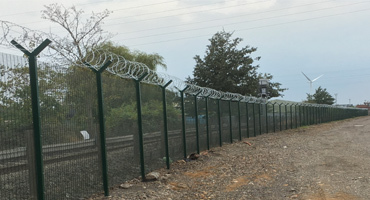 Concertina Razor Wire is a very cost effective way of ensuring that would be intruders can not scale over your boundary walls or fences. 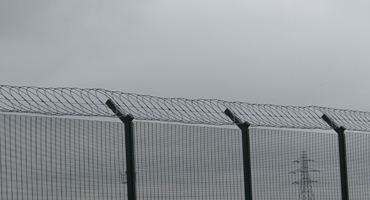 Razor Wire is one of the best anti-climb visual deterrents on the market and can be installed during the original fence installation or easily added to an existing fence. Due to the cost efficiency of the system it is predominantly installed in commercial applications such as commercial yards, electricity sub-station, utility compounds and prisons. Finish: All wire galvanised to BS EN ISO 1461. Never install razor wire at less than 2.1m above ground level. Ensure that the system can be seen by any person approaching by locating in a prominent position such as above a fence, wall or roof. Display warning signs at regular intervals. Ensure the area is well lit and signs are visible at night. By adopting the above approach, clients should avoid all possibility of legal action in the event of personal injury. It is the responsibility of the client at all times to ensure that the use of any anti-climb security fence or wall topping does not infringe criminal or civil law. Four Seasons Fencing Ltd cannot accept any liability in the event of any such infringement. Our product incorporates pairs of three point vanes assembled around a central fixed axis to present a freely rotating anti-scale obstacle. 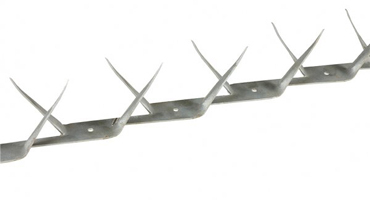 For your security we offer a range of serrated edge strips and security spikes suitable for gate and wall toppings. Concertina Razor Wire properly installed is very difficult to scale and offers a very visible deterrent to any would be intruder. 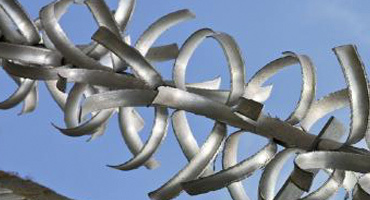 Our flat wrap razor wire system is neat and sits vertically above the security fence. 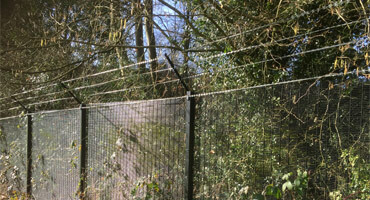 Installed as single strands above the fencing to increase security and send out a visual deterrent.